FLieutenant General Lewis Puller (Service No. 135517) was nicknamed "Chesty." Many thought it was because of his perfect posture and the fact that his torso resembled a beer keg full of bricks. Others think the many ribbons worn on his left breast inspired the nickname. 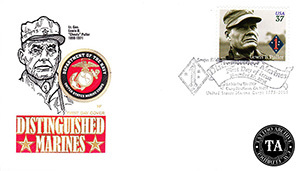 Whatever the story, Lewis Puller was a United States Marine officer who held the distinction of being the most decorated U.S. Marine in history. His awards for valor included five Navy Crosses, the Distinguished Service Cross, the Silver Star, two Legions of Merit with "V" device, the Bronze Star with "V" device, the Bronze Star, the Air Medal and the Purple Heart. Puller was born in West Point, Virginia and served his country and Corps with honor from 1918-1955. In the 1920's he fought in Haiti, in the 1930's in Nicaragua, he participated in some of the worst battles of World War II in the 1940s and he served in Korea in the 1950's. In 1965 Puller requested reinstatement in the Marine Corps in order to serve in Vietnam but was denied because of his age. 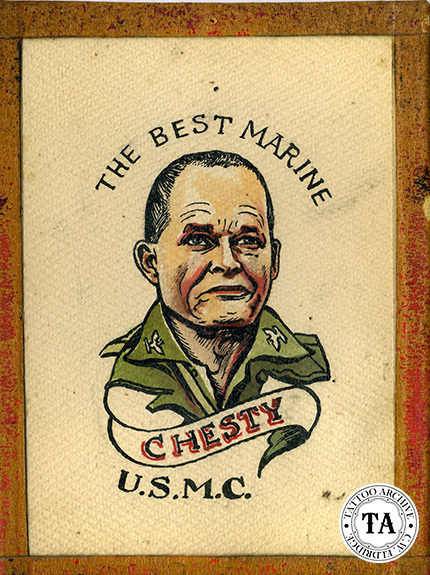 Chesty Puller was a Marine's Marine. He was a living example of what Marines aspired to be and many great quotes were credited to Puller. For example, "We're surrounded, that simplifies our problem," and "I want to go where the guns are." On first seeing a flamethrower he asked, "Where in the hell do you put the bayonet?" During Lewis Puller's lifetime and even after his death, he was honored in many ways by a grateful nation. In 1982 the United States Navy commissioned the USS Lewis B. Puller (FFG-23, and the headquarters building for the 2nd Fleet Antiterrorism Security Team at the Yorktown Naval Weapons Station in Yorktown Virginia was named Puller Hall. In 2005 the United States Postal Service issued its Distinguished Marines stamp in which Puller was honored. Perhaps not the most distinguished of honors was the naming on the US Marine Corps. Mascot, an English Bull dog, "Chesty." Lewis Puller died at the age of 73 in Saluda, Virginia. He was buried in Christchurch Parish Cemetery just off Highway 33, better known as "General Puller Highway", in Christchurch, Virginia.